Hi friends! I hope you are all having a great day so far! It's a little after 4pm here. I meant to take the kids to story time this morning but I couldn't find my keys. Last I knew, my hubby pulled the car into the garage for me. I was so upset. AFTER story time was over, he texted me and said he left them on the hook in the kitchen. Yeah, I didn't look there. Whoops! Ok, I wanted to blog this card I made for Flutter By Wednesday #156 before the time ran out. I am always doing that! I make a card and forget to blog then time runs out. So, here is my card. The theme is Clean and Simple. 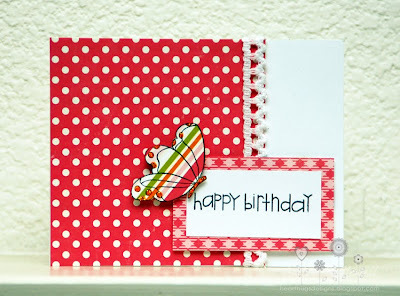 I decided to make a girly birthday card for this challenge. The sentiment is from Paper Smooches, I LOVE their stamps! The butterfly is from Hero Arts and the paper is Echo Park Little Girl. adorable card, love the lace trim you added on and the striped butterfly. oh this is beautiful, loved how you used the trim.